The village of Bekoji, in the highlands of Ethiopia, has produced long-distance runners who’ve won 16 Olympic medals in 20 years. What explains this remarkable success? The long-legged 32-year-old is wearing a pair of bright blue running shoes with shock absorbers on the heels, provided by his sponsor, Nike. A competitive marathon runner, he’s raced in Asia, Europe, and America. But his wife Askale Tafa has him beat: Their massive cabinet in the living room is packed with sparkling trophies, mostly hers. Fifth place, Boston; third place, Dubai; second place, Berlin. "African runners tend to be much happier and joyful about running. This is a generalization, but they thoroughly enjoy what they do." "Part of the reason the US in not producing large numbers of great distance runners is simply that the culture at large doesn't care about distance running—not like we do about basketball and football." Not long ago, Tolo and Askale were living a very different life: herding cattle and farming in Bekoji, the pastoral, grain-producing town in central Ethiopia, several hours south of Addis, where they grew up. They moved to the capital to join a large urban running club, but they’ve maintained their ties to Bekoji, capitalizing on their athletic success by opening a hotel back home. And they’re not the only champions from their town of 17,000. Bekoji has produced seven Olympic medal-winning runners: Kenenisa Bekele and his younger brother Tariku Bekele, Derartu Tulu and her cousins Ejegayehu Dibaba and Tirunesh Dibaba, Fatuma Roba, and Tiki Gelana. Among them, Bekoji’s runners have won 16 total Olympic medals—10 of them gold—and more than 30 world championships. For some perspective: The runners from this tiny town have hauled in more gold medals than India (population: 1.2 billion) has won in all Summer Olympic categories put together, and nearly twice as many as Indonesia (population: 247 million) has. The Dibaba sisters alone have won as many medals as Syria (population: 22 million) and Saudi Arabia (population: 28 million) combined, and Tirunesh Dibaba has racked up as many golds as Pakistan (population: 179 million). Between 1995 and 2004, the legendary Haile Gebrselassie, who grew up in the nearby town of Asella, held the world record for the 10,000 meters for all but two years. Kenenisa Bekele broke Gebrselassie’s record 10 years ago, and he’s held it ever since. This single-minded devotion is easy to see on the streets of Bekoji. Almost everyone in town—whatever his or her profession—wears running shoes, and people regularly gather in shops with TVs to watch major running events, especially when Ethiopians are competing. Tolo has a brother and sister who are runners, and his wife’s brother is one, too. The runners from this tiny town have hauled in more gold medals than India has won in all Summer Olympic categories put together. After I arrived in town, an arduous three-bus journey from the capital, I explored the track-and-field mecca at the crack of dawn, the time when Bekoji’s forests pulse with hundreds of casual and serious runners. The town is fantastically beautiful, surrounded by lush fields and green, cloud-tipped mountains. There is one main thoroughfare and market, and simple mud huts mingle with small, modern buildings that have electricity and running water. Everywhere you go, you’re flanked by animals—horses, donkeys, goats, cows, sheep, and stray dogs. On rare occasions, tourists and foreign journalists visit as well, seeking answers about the runners’ town. If Bekoji were simply home to a good runner or two, it wouldn’t be such an anomaly. Ethiopia as a whole has been renowned for its runners since Abebe Bikila—who came from a village in the Shewa region, northeast of Addis—won the marathon at the 1960 Summer Olympics in Rome. Not only did he break the world record for the event and become the first sub-Saharan African to win an Olympic gold, but he did it running barefoot. Bikila stunned the world again at the 1964 Tokyo Olympics when he won another gold only six weeks after undergoing surgery for acute appendicitis. Since 1960, Ethiopia has won 44 Summer Olympic medals—all in races 3,000 meters or longer, and mostly over the past 15 years. The phenomenon extends southward to neighboring Kenya as well. Middle- and long-distance runners from these two countries now hold more than 90 percent of the all-time world records and current top-10 world rankings for their events. Ethiopia’s most accomplished runners tend to hail from the Shewa and Arsi zones (Bekoji is in Arsi), while Kenya’s best are usually from Nandi county. All these regions run along the steep edges of the Great Rift Valley, at elevations of 6,500 feet or more. But Bekoji’s runners are exceptional even by the standards of this extraordinary region. Tolo explained that rural life cultivates strong, disciplined people—crucial characteristics for long-distance runners. Running, often barefoot, is simply a part of life in Bekoji. (In town, most people wear shoes, but farmers and shepherds frequently forgo them.) “We are running everywhere,” Tolo said, whether it’s shepherding farm animals or simply getting from point A to B in a town with virtually no cars. And if altitude helps build endurance, Bekoji has that going for it as well: It’s higher than many other towns in the Great Rift Valley, at more than 9,000 feet above sea level. Runners train in thin highland air (what some residents call “healing air”), which makes racing at lower altitudes relatively easy. The forest also serves as a natural training ground; runners zigzag between the trees and use their roots as an obstacle course. Of course, just under half the world’s population lives in rural areas, and many people live at high altitudes. Yet the planet has few Bekojis. What is unique about the town is its coach Sentayehu Eshetu, who trained most of Bekoji’s most successful runners. Sentayehu grew up far from Bekoji, in the eastern Ethiopian city of Harar. He was a gym teacher there, but had to flee his hometown after Ethiopia’s war with Somalia in the late 1970s. The 57-year-old coach has a knack for picking champions, though he was never a professional runner himself. “I can tell a great athlete just by looking at them,” he says. Top: Coach Sentayehu Eshetu lectures his athletes. Bottom: A young runner takes a break in his bedroom. I meet Sentayehu at an outdoor table at Hotel Wabe, the establishment Askale and Tolo opened two years ago. The coach—looking the part in his baseball cap, light windbreaker, and white running shoes—ticks off the qualities he looks for in a champion: running technique, posture, body type, discipline, and general health. “The first thing is the desire of the athlete,” he adds. As he speaks, passersby pay their respects, curious onlookers peer through the fence surrounding the hotel, and shepherds crack their whips in the distance. Sentayehu discovered Derartu Tulu, the first of Bekoji’s most successful runners, almost 30 years ago, when she was only 14. At the time, Sentayehu was working as a gym teacher at a school in Bekoji. Derartu—who went on to compete in the 1992 Barcelona games, where she became the first black African woman to win an Olympic gold medal—was a fierce competitor even as a young teenager. “There was nothing she wouldn’t do to win,” Sentayehu recalls. He began to personally train Derartu according to his own specially designed program, and he’s been training other athletes that way ever since. The coach ticks off the qualities he looks for: technique, posture, body type, and discipline. “The first thing is the desire of the athlete,” he adds. Derartu’s success inspired runners like Kenenisa Bekele, who started training seriously at age 18 when Derartu was already famous. By that time, Ethiopian runners had other role models to motivate them: Sentayehu explains that running became popular in Ethiopia after Abebe Bikila won the Olympic marathon in 1960. Abebe “made Ethiopia’s flag known to the world,” he explains. Two years ago, the government-run Ethiopian Athletics Federation spent more than $67,000 to open a live-in training center for young runners. Each year, Sentayehu selects 20 male and 20 female runners between the ages of 12 and 20 into his two-year training program, and many of them go on to join one of the professional running clubs in bigger towns and cities. (The training is so time-consuming that many end up dropping out of school.) Almost all come from farming families, and they don’t have to pay for the training. “We just need them to be ready mentally,” Sentayehu says. The coach isn’t entirely dependent on the Ethiopian government for financial assistance; the Girls Gotta Run Foundation, a D.C.-based nonprofit, now works with local organizations to help fund the training of young runners and the salaries of assistant coaches, including Bekoji’s first female coach. After 30 years, Sentayehu has his regimen down to a science. “I don’t want to toot my own horn, but I think I know how to take care of my kids,” he says. The runners wake up at dawn every day to a light, carbohydrate-heavy breakfast of besso, a local drink made from barley. After a brisk workout beginning around 6 a.m. in a forest near the training center, the coach leads a discussion in which he points out mistakes runners have made and gives them advice. Throughout the week, the young athletes cycle through grueling workouts using the track in the town’s stadium and Bekoji’s undulating terrain, which includes rolling hills and flat stretches. Sentayehu tells his trainees to maintain good hygiene, eat high-carb foods like wheat and potatoes, rest when they’re not training, and stay out of trouble. Alcohol and dating are strictly forbidden. Biruk Fikadu, 20, is one of Sentayehu’s protégés. He’s been running the 800 meters for three years, and his best time is an impressive 1:49. Tall and razor-thin, with a prominent brow, Fikadu is serious and polite. Though the weather is chilly at the outdoor table at Hotel Wabe, he isn’t shivering. He’s used to early-morning running in the crisp forest air. Top: Marathon runner Askale Tafa shows off her medals. Bottom: Residents gather to watch Bejoki runners in a televised competition. In Ethiopia, where the gross national income per capita is $400 and nearly 40 percent of the population lives below the international poverty line of $1.25 per day, running offers a means of escape. A very successful marathoner can earn hundreds of thousands of dollars from sponsorships, prize money, and fees for appearing in races (these can be as high as $250,000 per event), and many athletes start businesses back home with their earnings. Haile Gebrselassie, for instance, has amassed a small real-estate empire since his running days. And as of 2007, Tirunesh Dibaba was earning about $500,000 a year—and that was before she won three Olympic gold medals. But while Biruk grew up on a small farm in Bekoji, he says money isn’t his primary motivation for winning. “I want to defeat David Rudisha,” he says with a smile, referring to the Kenyan Olympic champion and world-record holder for the 800 meters. Despite Sentayehu’s tremendous influence, to visit Bekoji is to recognize that there’s no one answer to the question of why the town has improbably emerged as the world’s top producer of champion distance runners. It’s a fortunate confluence of genetics, geography, thin air, varied terrain, a temperate climate, and the rigors of rural life—bolstered in the past few decades by the talent-spotting of a singularly gifted coach and his strict, government-funded training regimen. In Bekoji, an entire culture has formed around running as a competitive sport and a professional path. When the World Championships in Athletics took place this August in Moscow, Sentayehu joined sports fans in Bekoji as they flooded restaurants, hotels, and videobets—shops with a television and chairs where tea is served—to watch the events. About 20 Ethiopians competed, including Bekoji’s own Tirunesh Dibaba, who took the gold in the 10,000 meters. The country finished sixth overall, winning 10 medals, including three golds. 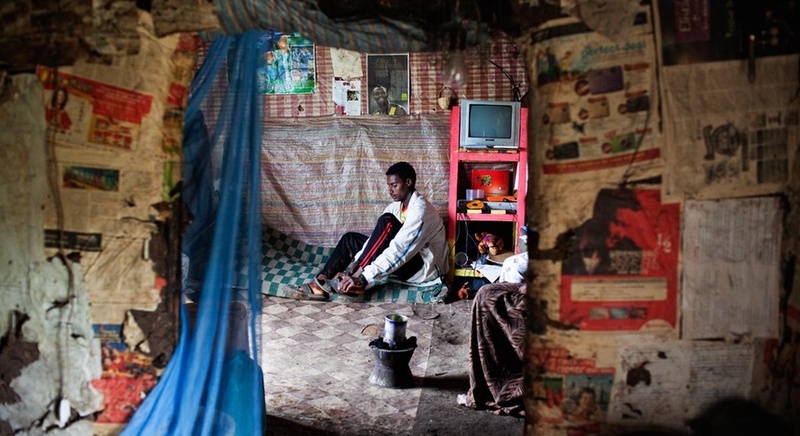 Sentayehu insists his life hasn’t changed since he became something of a local celebrity. He still gets the same modest government salary—roughly $115 a month before taxes—and still runs for his own exercise on Bekoji’s dusty streets. And he still swells with pride as he watches people from his little town win races around the world. Nick Ashdown is a writer based in Istanbul.